A 52-year old man collapsed at a fitness center while running on a treadmill. Bystanders initiated CPR and delivered one shock with the facility AED. Your team has been providing ALS care for 12 minutes. The patient remains in a slow ventricular rhythm without pulses (PEA) and you are considering treatable causes. Bag-valve-mask ventilation is being delivered through a 9.0 mm endotracheal tube inserted a few minutes ago (without interrupting chest compressions). End tidal CO2 (ETCO2) reads 27 mm Hg on your monitor with a ventilation rate of eight per minute and a good waveform. On closer examination, you notice intermittent appearance of series of small ETCO2 oscillations (waveforms). When you print an ETCO2 strip, you note the smaller waveforms have an end tidal of 12 mm Hg and a very rapid rate. There are no devices attached to the BVM except for the capnography circuit. Breath sounds are clear, bilaterally equal and no fluids or blood is visible in the endotracheal tube. As compressions continue you detach the BVM from the endotracheal tube (leaving the capnography circuit in place), the waveforms continue to appear intermittently. What are the possible causes of these unusual capnography waveforms and could these provide any clues to the cause of this cardiac arrest? 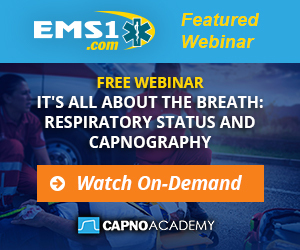 Capnography has tremendous utility in any patient with an artificial airway. In the difficult and often unpredictable transport environment, continuous waveform capnography is a standard of care; failure to use it is unquestionably negligent. During CPR the evidence for capnography goes beyond merely confirming and monitoring the proper placement of an advanced airway. The 2010 American Heart Association Guidelines for Cardiopulmonary Resuscitation and Emergency Cardiovascular Care placed increased emphasis on the value of capnography during resuscitation to confirm continued placement of advanced airway devices, monitor the quality of CPR and as an early predictor of return of spontaneous circulation (ROSC). The smaller, intermittent series of ETCO2 waveforms on the printed strip have a value ranging between 10 and 12 mmHg and a rate of approximately 120 per minute. An assessment by the team leader of the rescuer providing BVM ventilations demonstrated an appropriate rate of eight breaths per minute, reflected by the larger ETCO2 waveforms. Disconnecting the BVM to isolate the airway from any potential equipment malfunction was a wise move but did not eliminate the spurious oscillations. The smaller waveform rate matched the rate of chest compressions (120 per minute); in resuscitation literature, these are referred to as chest compression oscillations. Perhaps you have observed sounds associated with movement of air in and out of the lungs of a patient during the compression and recoil phases of CPR. When the quality of CPR is sufficient to provide a small amount of blood flow, circulation of oxygen will result in CO2 production. Quantities of air that exceed dead space (the volume of air that does not participate in gas exchange) may contain measureable levels of CO2. Theoretically, chest compression oscillations may be caused by movement of CO2 in and out of the airways during CPR. Note, however, that this notion of chest compression oscillations is wholly theoretical. It is not practical, based on how little we really know about chest compression oscillations, to make an assumption that they could not appear on the capnography of a misplaced airway. There have been case reports of these oscillations appearing on ETCO2 monitors connected to endotracheal tubes believed to be placed in the esophagus. Indeed, in this patient, the larger waveform (ETCO2 of 27 mm Hg) reflects not only proper placement of the endotracheal tube, but also effective chest compressions. Were the ETCO2 to suddenly climb above normal physiologic range of 35 to 45 mm Hg, it may be an indicator of ROSC. Were the value to drop below 10 mm Hg with a waveform still present, the resuscitation team should question the rate and depth of chest compressions, whether the compressor is fatigued (hence the reason for switching compressors every 2 minutes), if the patient has an extreme acidosis or whether the resuscitation is futile. While studies have associated an ETCO2 below 10 mm Hg with each of these conditions, experienced clinicians generally believe that high-quality CPR should produce ETCO2 values of 25 mm Hg or greater. Chest compression oscillations, while occasionally illustrated in textbooks, have not been widely reported in the literature and little is known about their significance. Because they are rarely noticed, chest compression oscillations serve more often to confuse clinicians. Curiously, one small study found chest compression oscillations superimposed on capnograms in 154 of 210 (73.3 percent) of cardiac arrests. For all practical purposes, they provide no additional information about the patient except perhaps reflecting a small amount of airflow resulting from chest compressions. Until research can elucidate a direct association between these chest compression induced ETCO2 oscillations and their actual cause, clinicians should resist the temptation to attribute anything more to them than the movement of small amounts of air associated with chest compressions. Have you captured an unusual waveform? Send us a scan (with any patient identifiers redacted) for review and discussion in an upcoming article. 1) Neumar RW, Otto CW, Link MS, Kronick SL, Shuster M, Callaway CW, Kudenchuk PJ, Ornato JP, McNally B, Silvers SM, Passman RS, White RD, Hess EP, Tang W, Davis D, Sinz E, Morrison LJ. Part 8: adult advanced cardiovascular life support: 2010 American Heart Association Guidelines for Cardiopulmonary Resuscitation and Emergency Cardiovascular Care. Circulation. 2010;122(suppl 3):S729 –S767. 2) Idris AH, Daya M, Owens P, O’Neill S, Helfenbein ED, Babaeizadeh S, Zhou SH. Resuscitation Science Symposium – Abstract 83: High Incidence of Chest Compression Oscillations Associated With Capnography During Out-of-Hospital Cardiopulmonary Resuscitation. Circulation. 2010; 122: A83.